You deserve it! You really do - and now with a homemade Typical COsta Rican breakfast included in the price every morning of your stay at 7:30AM*. A beautiful, private, quite home located in the El Salto Estates gated community where you can sit comfortably while watching your children play and have fun in our giant pool or on our awesome jungle gym (pun intended). Bring your friends and family - there is plenty of space here at theCasa Mariposa. Our staff is gracious, caring, hard working and ready to serve! So, yes! Book now! Do not miss out on this awesome opportunity for rest and relaxation at a price you can afford! This house has 4 Master Bedrooms - each with its own bathroom and one additional bedroom with a king-size bed and the bathroom just outside. The downstairs living room (which has two twin beds and futon and serves as the 6th bedroom) shares a bathroom with the 5th bedroom. There are 2 additional half bathrooms and an outdoor shower. This open air style house is situated to where it is surrounded by over an acre of tropical gardens and peaceful forest. There are spectacular views of the Talamanca Coastal Range and 6000 foot Mount San Geranimo. There are daily sightings of exotic Costa Rican animals such as Blue Morpho Butterflies, Sloths, Monkeys, Jewel-toned Hummingbirds, and now Scarlet Macaws!! The 5-Star Gaia Boutique Hotel (only 200 meters away as the crow flies) began a program to reintroduce Native Scarlet Macaws to the Manuel Antonio area about 1 year ago. And the lucky guests of the Casa Mariposa are right in the flight path of these gorgeous, amazing birds!!! The are sightings virtually everyday!! This gorgeous home has multiple Master Suites for multiple families traveling together! This is a 5/6 bedroom/5 bath/2 half bath, home which has a second living room which can be converted into a 6th bedroom. WE ALSO HAVE AN OUTDOOR GRILL FOR BBQ BY THE POOL!! There are covered terraces surrounding most of the upper level and the bedrooms at pool level. The house can be opened up completely to these terraces allowing for a tropical out of doors living experience. Monkeys pass by in the trees outside our bedrooms most days and an occasional sloth has crawled across our property. Come and hang-out by the pool - we have huge decks, both for sunbathing and plenty of space in the shade - and the pool is huge and was planned for children of all ages with three separate depths: 30 centimeters for toddlers and small children, 120 centimeters for moms and dads to walk smaller non-swimming children around and then a full 2 meters where the slide empties into the pool! There is also an outdoor shower right next to the pool to wash off children before bed without having to convince them to take a shower inside the house!!! The hillside pool is situated beneath towering jungle trees where White-faced or Titi Monkeys are often swinging through the branches. There is fantastic bird, butterfly, and iguana watching right from our decks. There is 24 hour security in this gated, secure community. The house is very private and quiet, unlike so many rental houses and hotels crammed along the busy main road and with giant walls as your next door neighbor. You can walk to the main road in three-to-five minutes where there are buses and taxis to take you to Quepos or the gorgeous beaches of Manuel Antonio. Within a 10 minute walk are the restaurants: La Gondola, El Arado, and La Luna at Hotel Gaia! By car you are only five minutes from the National Park and some of the worlds most beautiful beaches or equal distant from the entertaining town of Quepos. There are generous parking and storage areas. For your pleasure and comfort, the Casa Mariposa offers the following amenities: WIFI, Phone, air conditioning in all the bedrooms PLUS in the living room (most houses, even the most luxurious here in Manuel Antonio do NOT offer AC in the living room - ask for yourself and you will see!!) , and there are three flat screen TVs and a DVD player. We have a well outfitted full kitchen. The washer and dryer and currently next to the kitchen. Outdoors we have a teak wood jungle gym for kids, BBQ grill, and fantastic pool complete with its own water slide. After an exciting day in the tropics, the pool and terrace make for a relaxing evening. We offer housekeeping everyday EXCEPT Sundays! Babysitting services can be arranged by the concierge. *Breakfasts is only prepared and served by 7:30AM as the chef/maid must continue on with her day of work (no breakfasts nor maid service on Sundays nor on Costa Rican national holidays). Breakfast includes: scrambled eggs, gallo pinto, maduro, and toast. No exceptions, no substitutions, no changes to the menu are allowed. Should you like to buy bacon or fruits, the maid/chef will gladly cook it for you or cut up the fruit. I moved to Manuel Antonio in Aug of 2004 because I simply fell in love with the delightful Costa Rican people and the convergence of powerful elements all meeting in one place - the mighty Pacific Ocean, the strong sun, the wildness of the jungle, the tropical animals and foods, the strong winds and rains . . . We lived there with our two girls until April of 2012 when we moved back to Florida - and we now long for the days when we get to go and visit Manuel Antonio ourselves. We hope you love Costa Rica as much as we do! We hope you find the peace and joy and harmony we tried to instill in this house and the surrounding gardens. We love entertaining guests - always have. We wanted a comfortable house that would be practical and fun for families. I know from experience that can be difficult to achieve.The beach, the ocean, the waves, the mountains, the sunsets, the clean air, the nice people - why would you not want to visit here? This house is wonderful for families and for Multiple Families traveling together that will NOT break the bank! Kids have outside and the pool, and the biggest kids have plenty of space for themselves too! Right in the middle of Manuel Antonio to where access to the beaches is a five-minute drive and Quepos is a 4-minute drive, but removed from all the noise and crazy drivers. True peace in paradise! Sorry, no international phone calls. We provide plenty of towels, both for home use and for beach use. We have WiFi!!!!! We have recently upgraded our internet speed and now have much faster WiFi! We have an upstairs dining table which seats 14 people seated very close to one another. There are 4 televisions (all HD and wall mounted) in this house! (2) This house has four brand new Plasma TVs and one DVD players. There is HBO and Cinemax included in over 150 channels. It's of outdoor deck space as well as roofed outdoor deck space! Huge pool with swim lane and fantastic slide! 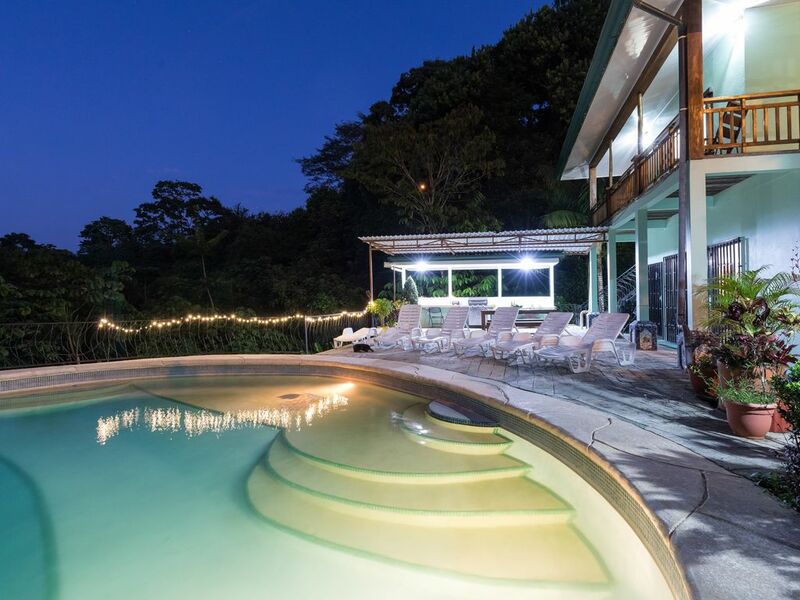 This house is located about 1.5 miles on the road to Manuel Antonio National Park. This is a secure, gated community with lovely hiking trails, gorgeous views, silence, peace and a ton for kids to do. This house is perfect for 2 or 3 families traveling together who want to keep their kids occupied. There is a huge pool and a jungle gym to keep all age ranges happy. We have a great patio for grilling with an outdoor sink next to the pool. The monkeys come by with frequency since this house is on a monkey trail. There are 5 restaurants and a spa within walking distance. Our home has kid-safe railings on the balcony that are sometimes difficult to find in this area. Amazing time in Costa Rica, perfect house! My family and I just returned from an incredible experience in Costa Rica. There were 15 of us ages 10-70 staying for 1 week. We had plenty of room to have our own space, everyone had comfy beds with great A/C. We saw monkey every day in the trees and one day they even came to our patio. Macaws were daily visitors, and even had a sloth on the property one day. This house feels like you are truly staying in the forest yet a 5 minutes taxi drive to all conveniences. David the owner was available to us and was so handy to provide great suggestions for food and shopping, and excursions. I will definitely suggest this property to anyone going to Costa Rica, and we hope to return someday as well!!! Thank your for one of the best family vacays we have all had!!! we were a group of 9 and had a great time. The place was great and the maid came in extra early so we got feed before our fishing trips. First off we love the Jungle House. The weather, the week of Oct 19 to 26 2018 was marvelous. Only rained really one day. The house was plenty big enough for us 5. (2 couples and me). We saw macaws fly over each day and some monkeys our last 2 days. The pool is a delight to have and the view into the valley with the mountains in the distance are outstanding. The house is plenty big enough for 4 couples with everyone having their own privacy easily. Now to my 2nd part of the review and this only goes for previous guests. We stayed Oct 20 to 27 2017 and we as a group fell in love with Roxanne. Even though she doesn't speak much English, she carried on a conversation with us. We felt like she was family. So if your looking for Roxanne, she isn't there. We were heartbroken. That's why no 5 star review. What a perfect week! The house was all that we needed - plenty of room for our family of 9, clean and safe. (: The pool, the property, the location, the wildlife; all amazing! Breakfast every morning was wonderful - can't beat Leahas (sp?) Gallo Pinto. Finally, there is Josue. Josue is AMAZING! He is available to help with tours and general needs, his assistance with everything was absolutely top notch. If you go to Manuel Antonio Park I strongly suggest using him as your guide - so knowledgeable and personable. Loved it, thanks! capuchin monkeys, and the helpful staff --- and the TV worked for the World Cup ! Manuel Antonio beach or Playa Espadilla - was just rated as the Best Beach in Latin America this past April 2013 and Costa Rica is the happiest country on the planet according to various surveys! Come see what all the fuss is about! Don't want to go to the beach, then maybe try a ziplining tour, or some deep sea fishing, or raft down one of our awesome white-water rivers. Or just hang out at one Manuel Antonio's fantastic Happy Hour bars! Typical Costa Rican Breakfasts are included: scrambled eggs, gallo pinto, maduro. Rates are subject to change until confirmed. Rates are for up to 12 people. GROUPS OF 5 or fewer ask for 10% small-group discount. Dgos and cats are allowed. Pet fee is $100 PLUS any damages occuring from the pet. No parties. No prostitutes. Dinner Services available for an additional fee. No swimming in the pool at night.